Fall Updates from Back to Eden! Hello friends! Weâ€™re so pleased that this season is finally upon us and as such, weâ€™re rolling out all new Fall-inspired items! You can find a variety of these new additions at all three of our locations, including six new cupcake flavors, a wide variety of seasonal morning pastries and a lineup of pizzas that capture the bounty of Autumn. While you will still find favorites like the Margherita and Italian Tempeh, you wonâ€™t want to miss out on these new creative combinations! Winter Squash Pizza with herbed cream sauce, delicata squash, hickory smoked chickpea, broccoli rabe and fresh oregano. 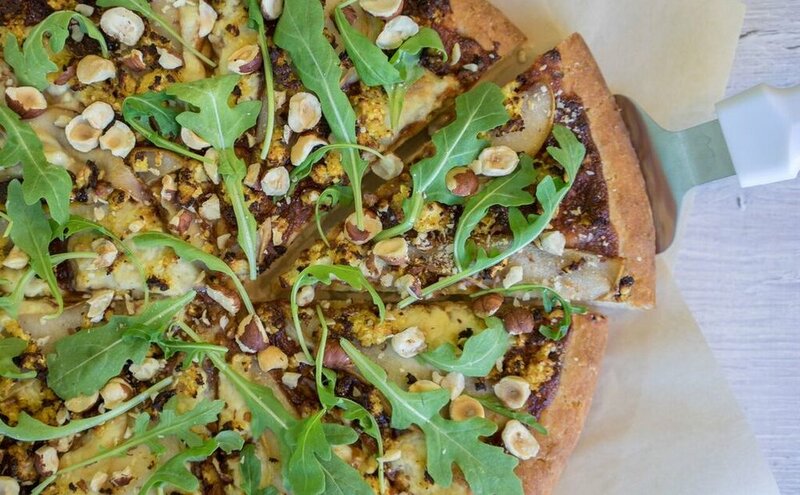 The Pear-BBQ sauce pizza with house mozzarella, white balsamic pear, hazelnuts, cauliflower parm and arugula. 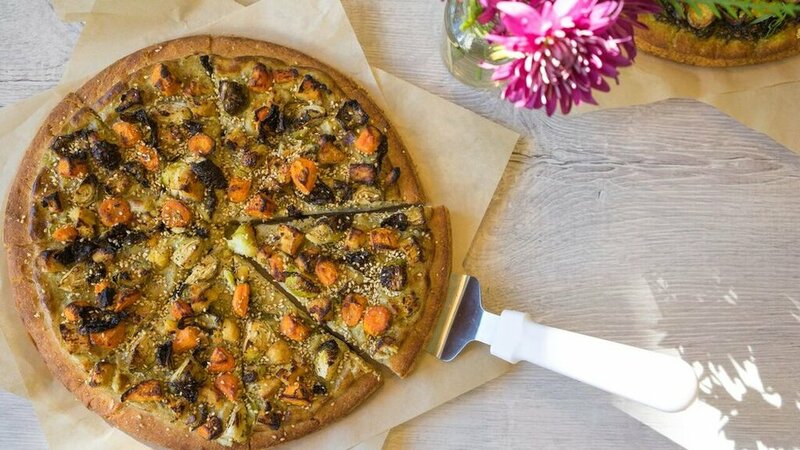 Brussels Sprout pizza with herbed cream sauce, chopped Brussels sprout, maple glazed tempeh, dijon carrot, and sesame seed. As the days get shorter, we know how tough it can be to find the motivation to head out for a meal once youâ€™re warm indoors. Weâ€™re pleased to announce that weâ€™re now partnering with Caviar delivery service to bring Back to Eden Bakery to your front door! Order directly from our website or download the Caviar app to place your first order! And for those dining in we have now begun table service so that our guests have the best experience possible. As some of you may know, the Tidbit Food Cart Pod, the home of our beloved food cart, will be closing after this weekend to make room for more apartments. We have truly enjoyed serving the South East Portland community and are pleased to announce that we are relocating only a short distance away to the Woodstock area. Weâ€™ll be joining a small, tight knit group of carts at The Joinery located on 4804 SE Woodstock Blvd, Portland, OR 97206. We look forward to settling in with our new neighbors and hope that you will come to visit us in our new home! Weâ€™d like to extend our deepest gratitude for all of those who joined us for the Grand Opening of our cafe on the 8th Anniversary of doing business on Alberta Street. It was a huge success and with your help, we were able to raise funds for the awesome organizations that joined us that night including One Tail at a Time Dog Rescue, The Oregon Justice Resource Center, and X-Ray FM. If you were not able to join us, we celebrated with pizza, cupcakes, a live broadcast, DJâ€™s music, puppies, and more! We look forward to hosting more events in our new cafe down the road so stay tuned for more opportunities to pull our community together. In spite of all the tragedies befalling the world these days we have faith in the generosity of our communities and know that by pulling together we will have the power to make a real difference in the lives of those affected. While it may not be in your news feed any longer the storm is far from over for Puerto Rico and relying on the Federal government to provide assistance is clearly not enough. The majority of people are still without power, clean water and food is in short supply and those who lost their homes are now facing a long and uphill battle to rebuild. We will be donating 10% of our dinner sales this upcoming weekend directly (Friday 10/6- Sunday 10/8) to the family of one of our cherished employees who hails from Puerto Rico. Their family and friends are still on the island dealing with the aftermath and devastation of the storm and we want to provide as much support as we can to help them get back on their feet. Additionally, we will have a jar out at our Alberta cafe for cash donations all week with all proceeds going to directly to their families. We are also accepting physical donations such as batteries, battery powered radios, lanterns, non-perishables, baby food, toiletries, etc. Here is an Amazon wishlist if you need some ideas of how you can best contribute. EstÃ¡s en nuestros corazones y en nuestras mentes Puerto Rico! Paâ€™lante querida familia! Pa'lante para siempre! Viva Puerto Rico! Time to Start Placing Your Holiday Orders! Back to Eden Bakery Cafe Grand Opening!